"The Argmore was opened in 1913, and two years later, was acquired from its original independent operator by the Alfred Hamburbger circuit. It was located... near the intersection of Argyle Street and Kenmore Avenue, hence the theater's name. In 1922, the Gumbiner Brothers took over operation of the Argmore. Acquired by the Essaness circuit in the 30s, it continued to be operated by that chain until closing in the early 1950s." The Argmore was later converted to retail use. 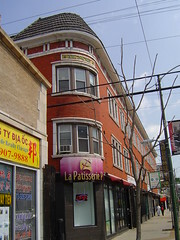 It currently houses La Patisserie P, Foremost Liquors, and other businesses. Click on image for larger view at Flickr.